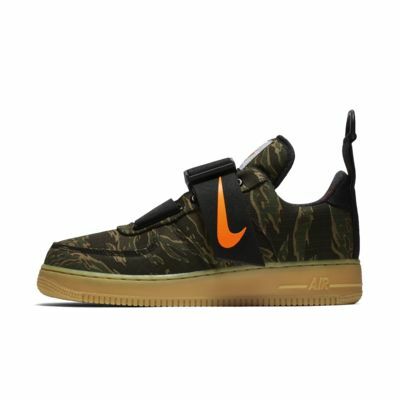 The Nike Air Force 1 Utility Low Premium WIP Men's Shoe brings a rugged look to a basketball icon. This collab with workwear retailer Carhartt adds canvas and camo ripstop for durability, while an Air Sole unit offers classic AF-1 comfort. The Nike Air Force 1 Utility Low Premium WIP Men&apos;s Shoe brings a rugged look to a basketball icon. This collab with workwear retailer Carhartt adds canvas and camo ripstop for durability, while an Air Sole unit offers classic AF-1 comfort. Canvas and camo ripstop add durability. Buckle closure slides open for easy on and off. Have your say. Be the first to review the Nike Air Force 1 Utility Low Premium WIP.